On 16 September Kelly and I set off for a holiday. This was Kelly's first real break in a year so we have planned something different, a camping trip rather than scuba diving (yes, we do have other interests!). We head out over the Blue Mountains and then up towards Mudgee. We stop for a break at the information bay leading into town and notice that there is a scuba shop here! 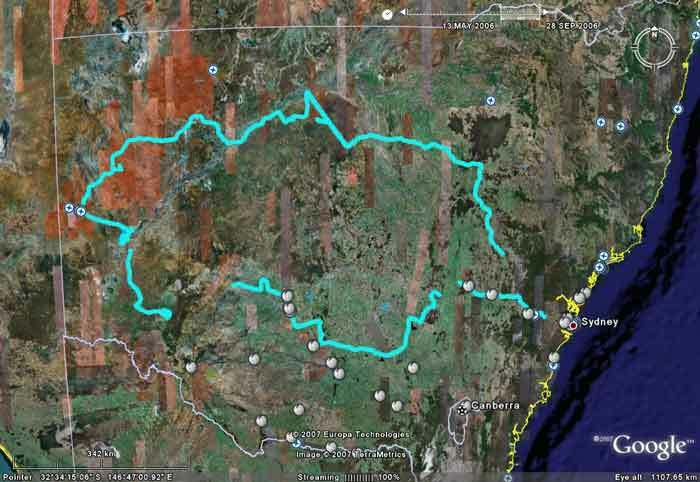 We then head off to Coonabarabran via Gulgong. Our first stop is to be the Warrumbungle National Park and after a quick refuel in Coonabarabran we arrive in the park in time for lunch, by-passing the Siding Springs Observatory. 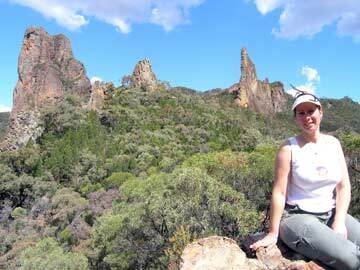 We stop at a picnic area just inside the park and after lunch, walk the short distance to the lookout. This gives great views across the main part of the park, including towards The Breadknife. After this we go into the park and to the visitor centre to see what camping areas are available. The information on the national park web site is almost non-existent and not at all helpful for planning a trip. We pay our fees and head to the two areas to have a look. The main one is over crowded and not at all appealing to us, so we head to the other one which is located on the right side of the main road to Coonamble, a bit further to the west of the visitor centre. Here we find only a couple of people and lots more room. 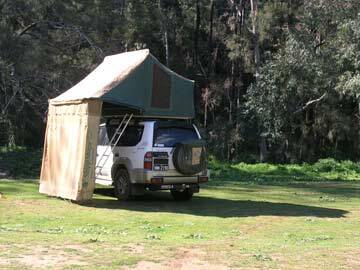 As we have borrowed Les and Elly Caterson's ShippShape roof top tent to try out (we have since purchased our own), we set up our camp in a few minutes. There is still lots of light so Kelly and I decide to do a walk. Within a minute's walk is the start of a track called Split Rock Walk. This is an easy 500 metres followed by a fairly hard 3 kilometres of uphill and downhill along a simple track. 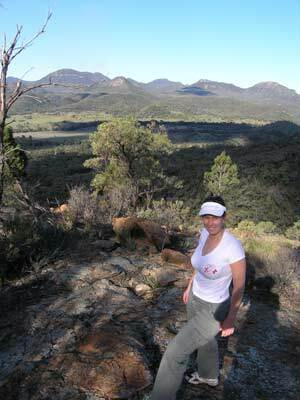 As well as seeing some goats and lizards, we have some great views from different parts of the track. We arrive back at the campsite to find kangaroos and emus all over the place. It is time to have pre-dinner drinks and nibblies and this is greatly enjoyed (as it was every evening). After a barbecue dinner, we relax with a couple more drinks enjoying the night sky. If you have never been to this area, you should as the night sky is the most spectacular I have ever seen. So many stars, even more than I have seen in Kosciuszko NP, are visible. The camping site is pretty high, we are at an altitude of about 800 metres. We see a few shooting stars and satellites as well. During the night we are awoken a few times with some horrendous noises coming from near the camping area. Wild pigs we think. 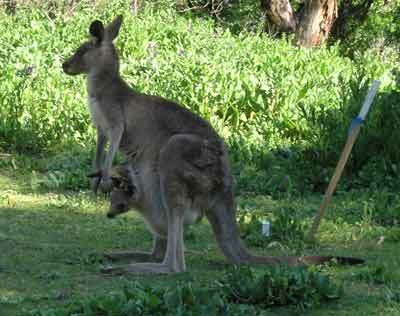 The next morning we awake to even more emus and some kangaroos around the car. 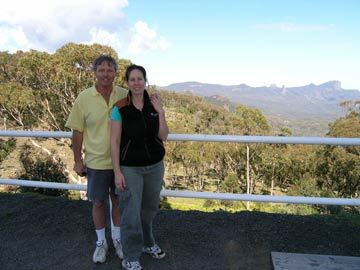 After breakfast we go to the Siding Spring Observatory but we find that the guided tour is not available on Sundays. Damn! We have a look around, including inside the main telescope dome and look at the displays inside. Very interesting. Next time I will make sure that we are there on a weekday. We decide to do a walk, this time a longish one. We start before lunch and head up towards The Breadknife along a very gently sloping track. This track is great, one of the best I have seen in NSW. 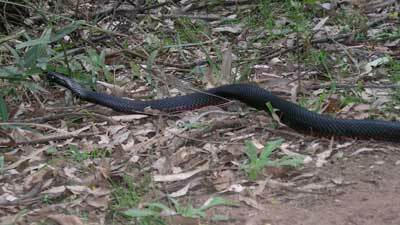 We come across a red-bellied black snake on the track and carefully go around it. We stop for lunch at a spot off the track that gives more great views of The Breadknife. After lunch we head on, the track getting steeper. Now the track is built from bricks, made about nine years ago. Excellent! Steeper and steeper, soon we need to stop to have a few breathers. After about 90 minutes we come to the start of a new set of stairs. This supersedes an old windy track and heads straight up the hill. Again, some great views. We arrive at the current end of the stairs (more is in the process of being built) at the base of The Breadknife. We then head around in the other direction and come to a small hut where you can stay. Up above here we climb to a point and have the best views so far back over the valley as well as towards the hills. We return back to the car and head back to the camping area for a well earned beer (or two). It is now dark and while cooking dinner, I hear more pig grunting so I head across the now empty camping area to investigate. Well, unless pigs can fly, this noise is not coming from a pig! The sound is coming from up in a tree and shining my torch shows that there is a koala there. I had heard that they make a grunting noise but had never heard it before. I call Kelly over and she sees her first koala in the wild.